Mt. Everest (8,848 m), the highest mountain in the world is located in Khumbu region at the northeast part of Nepal sharing the border with Tibet. Mount Everest bears other three names such as Chomolungma, Sagarmatha and Qomolungma which has its own legend behind. Many unsuccessful attempts to climb the summit of Mt. Everest had been taken from 1921 by different expedition teams. After many hard efforts, sacrifices of many human lives and continuous research the mountaineering heroes Tenzing Norgay Sherpa from Nepal and Sir Edmund Hillary from Italy representing British team for Mount Everest Expedition paved the successful way to ascend to the summit of Mt. Everest on 29 May 1953. Conquer the Mt. 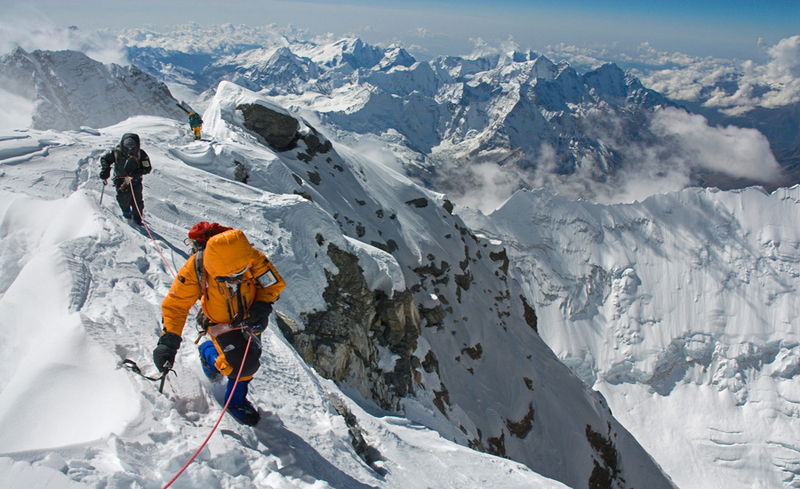 Everest always remains as a pride and lifetime achievement for the climbers. Many mountaineers follow the same route (The South Col route) followed by Sir Edmund Hillary and Tensing Norgay Sherpa; successfully scaled Mt. Everest many times and keep and break down the different records by ardent mountaineers since then, but still it is a big ultimate challenge even for experienced climbers to make a dream true by reaching the summit of Mt. Everest. The Mt. 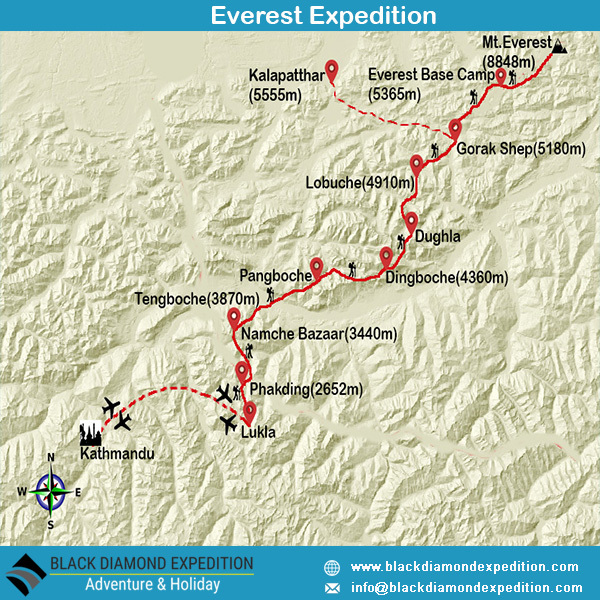 Everest Expedition starts from the Lukla and treks up to the base camp. At Everest Base Camp, we spend 2-3 nights for acclimatization and take side trips. Further, we climb up upper camps in favorable weather and taking ample of time to acclimatize in each camp and then finally attempt summit. Upon arrival at the Kathmandu Airport (TIA), you will be welcomed and greeted by our representative and then transfer to the hotel. After the check in, there will be a pre-trip discussion in Black Diamond office where we can meet our trek leader and other team members. Black Diamond briefs us regarding the trip as well as provides us an opportunity to ask any questions we may have regarding our upcoming adventure. In the evening, we will organize a Welcome Dinner at an excellent traditional Nepalese restaurant where you will enjoy a Nepalese cultural program as well as a fine meal. After breakfast, break the day with guided tour to several of the most historical and spiritual attractions of Kathmandu. The first visit is made in Swayambhunath Stupa- oldest stupa situated on the hillock. Enjoy the bird eyes view of Kathmandu Valley and mountains. After then visit Kathmandu Durbar Square - Palace of Malla and then Shah King of Nepal. Visit Kumari Ghar (living goddess), Kasthamandap (made up of a single tree), Hanuman Dhoka (Gate to enter the palace) and many more temples. Finally, visit in Patan Durbar Square- the city of fine art and architecture. Visit Krishna Temple, Palace square, Mahabauddha, Mahabihar and many more temples and masterpiece monuments. Late afternoon, there will be a pre-trip discussion where we can meet our trek leader and other team members. Black Diamond briefs us regarding the trip as well as provides us an opportunity to ask any questions we may have regarding our upcoming adventure. Overnight in Kathmandu. Early morning after breakfast transfer to Kathmandu airport domestic terminal to fly over Lukla, a gateway destination for trekking in Everest Region. After 40 minutes adventurous and scenic view flight, we reach in the Tenzing Hillary Airport at Lukla. Here we meet our other crew members and then we begin our first day' easy trek through forest, villages and along the Dudh Koshi River to Phakding. Today also we follow the Dudh Koshi River and cross suspension bridges many times, one of which is the famous Hillary Suspension Bridge. On the way, we can see the beautiful view of Mt Thamserku (6618m). Passing through the small village of Benkar, Chumoa, Monjo we enter into the Sagarmatha National Park. We cross the last village of Jorsale before Namche and then gradual walk through the forest and bridges until we reach the confluence of Dudh Koshi and Bhote Koshi Rivers (Larja Dobhan). After then about 2 hours steep climb we reach Chautara from where we get the first sight of Mt. Everest. From there another 1.5 hours easy walking bring us to Namche Bazaar, the gateway to Mt. Everest and the main trading center. After 2 days walking we take a rest in Namche Bazaar to acclimatize the body. It is recommended to stay active during the rest day also which helps to acclimatize our body quickly. Walking little high altitude around 100 ft will help to acclimatize properly. Morning, we do hike in Thame and later explore Namche Bazaar. Today the trail is gradual ups and downs with the magnificent view of Himalayas and Musk Deer, Monal, Blue Sheep may come across on our way while walk through the jungle. We begin the day with gradual walk down up to Kayanguma, passing by Tenzing Norgye Memorial Stupa and viewing massive Ama Dablam, Lhotse Shar, Taboche, Thamserku more snowcapped peaks. After then little ahead we reach Sansa, the junction to Gokyo Valley and Everest Base Camp. We follow the right trail to Everest Base Camp through pine forests and come across the bridge over Dhudh Koshi River in Phungi Thanga. From there the trail is little steep through the forest of rhododendron and fir trees to Tengboche village, the home of biggest Buddhist Monastery of Everest region and the close up view of massive Ama Dablam, Nuptse and Everest is very impressive. Morning witness and capture the awesome view of mountains in the background of Tengboche Monastery. After breakfast, we continue the journey through gradual down from rhododendron trees and come across the suspension bridge over Dudh Koshi River. About an hour further walk will bring us to Pangboche which offers a dramatic view of Himalayas and village. Passing by several Chortens, Mani walls and Pangboche Gompa we continue the trek through the village of Syomare, Orsho and Samso Ogma where we meet the junction. From there we follow the right path and after crossing the bridge over the confluence of Khumbu Khola and Imja River we climb steep path to Chyakunwa Kharka from where we can see the spectacular view of Taboche, Ama Dablam, Khangteka, Thamserku, Nuptse, Lhotse and many more. After few minutes gradual climb, we will be welcomed by chorten and prayer flags in Dingboche. Today all the way is dry but offers awesome Mountain View on all sides. We start the trek walking gradually through the Khumnu Khola Valley and reach the yak herder’s place, Dusa (4503m). After then following the narrow trail we reach Phulung Karpo where camp site was asserted during first successful Everest Expedition in 1953. We cross the small wooden bridge and climb steep up to Dughla. Dughla offers marvelous view of Nuptse, Cholatse, Thamserku and several other magnificent peaks. We continue our walk through moraine of the Khumbu Glacier and climb to Thukla Pass (4830m). At the top there are piles of stones with prayer flags, memorials of death climbers including Babu Chiri Sherpa, 10 times Everest submitter and Scott Fischer, American mountaineer. Further crossing the Khumbu Glacier we get the beautiful sight of towering Mt. Nuptse (7855m) and then steep trail lead us Lobuche. After early breakfast we start trek through the moraine of Khumbu glacier. Passing through Italian Research Center and Lobuche Pass (5110m) we reach to Chongri Glacier. On the way to Chongri Glacier we get the first sight of the summit of north ridge of Mt. Everest along with 360 degree view of snowcapped mountains including Mt. Pumori, Mahalangur, Lingtern, Khumbutse, Nuptse and many more. Walking up through boulder path of Changri glacier we reach Gorak Shep. Leaving the Kalapathar (view point) on left and passing by Indian army mountaineers' memorials we continue towards Everest Base Camp which takes us around 3 hours to reach. We set up our camp here till we return from the summit of Mt. Everest. We spend several nights at Base Camp for proper acclimatization before we head to the higher camps. Upon arrival at base camp, we organize refreshment climbing training covering climbing techniques, glacier travel, rope fixing, ascending, descending, safety techniques, abseiling, belaying, use of oxygen, mask and regulator etc. Climbing Sherpas complete their duty of preparation by ensuring that the high camps are well stocked with tents, food and oxygen for the summit push. We return to base camp for rest and recuperation before we make the summit attempt. After getting confirmation of a favorable weather forecast, we head up with our summit plan to ABC and then CAMP I, CAMP II, CAMP III, Camp IV and then the SUMMIT. After base camp, we need to go through crevasses and large ice block. Our Sherpas fix the ropes and aluminum ladders in Khumbu Ice Fall to climb in Camp I (6,400 m). Camp I is situated at the flat top of ice block. We stay in Camp I till the Camp II is set by our Sherpas. After set up of our camp II by Sherpas we move up. Camp II is located on the base of the Mt. Lhotse wall. Mostly the weather remains fine here but challenge is the violent wind that can even destroy our tents. Camp II will be the base till our Shepra will fix the camp III and IV in high altitude. After acclimatize properly in Camp II we ascent to Camp III with the help of fixed rope. Camp III is adjoining to Mount Lhotse wall. We may need oxygen on this height, so keep it handy. We have to climb the steep down-slopping rotten limestone and cross snowfield route that moves ahead to the east before finishing the flats of the South Col.
As the height gain the oxygen level become very low and we may feel discomforts. So we need to use oxygen at this height. Climbers need to go through the steep allow bands. Cross short snowfield, the route takes up the Geneva Spur to the east before finishing the flats of the south col. Camp IV is located at the height of 8,400m, is the last camp of the Expedition. From Camp IV, summit is about 500m above. This is the final and dangerous part of the climbing as the wind blows so ferociously and violently. Weather may change frequently. The normal best way to reach the summit is via the narrow South - East Ridge. After breakfast, we continue to climb down the journey with a spectacular views of Ama Dablam, Khangteka, Thamserku, Nuptse and others via Chyakunwa Kharka. We cross the suspension bridge over the clnfluence of Khumbu Khola and Imja River. The trail ascends through the village of Samso Ogma, Orsho and Syomare following the route of several Chortens, Mani Walls and Pangboche Gompa. We happen to see the dramatic view of Himalayas through the rhododendron forest and go across the suspension bridge over Dudh Koshi River before we reach Dingboche. Overnight at Dingboche. The next morning, we follow the same route that we took while ascending towards Everest along the rhododendron forest and the magnificent views of many more mountain peaks. We cross the suspension bridge passing through the Gokyo junction passing by Tenzing Norgye memorial stupa before we reach Namche Bazaar. Overnight in Namche. After breakfast in the morning, we follow the same route and descend down towards Lukla. The trekking trail shows the beautiful landscape and the spectacular mountain views. Finally, we reach Lukla and spend the night there. After breakfast you are free till the departure time. Approximately 3 hours before your scheduled flight, a representative from Black Diamond drops you to the airport. Kathmandu - Lukla - Kathmandu flight tickets with 60 KG cargo per member. Trekking from Lukla to Base camp to Lukla with accommodation in Lodge or camping. Porter & Yak from Lukla to Base Camp & back to Lukla. 1 tent for each 1 person during expedition – “North face brand V-25” or similar tent. The equipment like main rope, Ice bar, sable for clear snow. Ice piton, ICE Crew. Dining tent, toilet tent, table and chares, Mattresses for expedition on the basis of sharing with other members. Liaison officer's allowances equipment for Expedition, flight ticket, insurance, daily wages sharing with other groups of Nepalese staff. Expedition Crew’s (Nepali staff) allowances for Expedition, flight ticket, insurance, daily wages etc. Peak permit for Everest South Face climbing. This is sharing permit with other climbing group member. Base camp Guide, Cook, Kitchen boy and Kitchen helper sharing with other members of the climbing group. Emergency Oxygen- Mask and regulator (If use, pay it full cost). (USD 600.00 per set). Solar panel for light and charging batteries. All international air tickets to and from Kathmandu and all airport taxes (wherever it is applicable). All Lunch and dinner in Kathmandu. Air cargo customs clearance duty fee for the expedition goods sent by the climbers to the Kathmandu prior to their arrival in Kathmandu. All expenses of the personal nature, like laundry, postage, telephone calls, bar bills & beverage, camera & photography expenses. The extra nights stay in Kathmandu and other tour activities by the climber, other than the fixed number of nights’ stay as mentioned in the expedition itinerary package above.